Organic. Plastic free. Totally chlorine free. Perfume free. Natural materials. Extra soft. Biodegradable. USDA certified biobased product - product 91%. Vegetarian Society approved.Why natural pads? 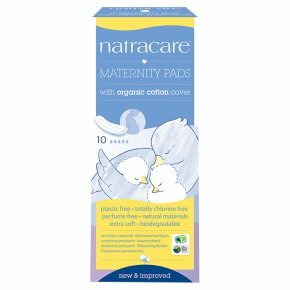 Natracare's maternity pads are ideal for total comfort and security in the days after giving birth when delicate skin needs to be protected from irritating synthetic materials. These extra soft, extra-long, breathable Maternity pads are made by using soft organic cotton and carefully sourced natural materials that are gentle on your skin and the environment. They are recommended and loved by midwives and mums.